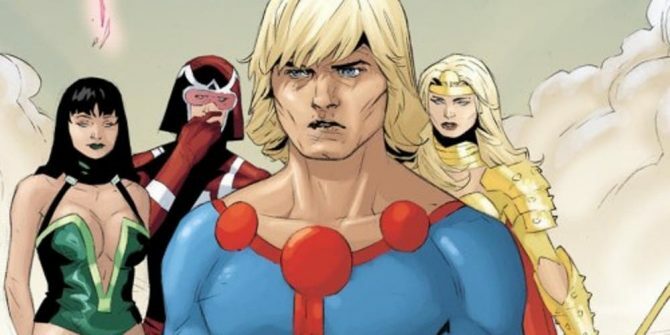 Confirming longstanding geek rumors, Marvel President Kevin Feige confirmed that the upcoming film version of The Eternals will feature an out-gay superhero. For the uninitiated, The Eternals follows a group of superhumans who gain powers from genetic meddling by an alien race called the Celestials. After years of warring between factions that wanted to rule humanity like the Deviants, and the more benevolent Eternals that saw themselves as human, the latter migrated to space, founding a colony on Uranus (seriously). They’ve since returned to Earth on occasion, forming bases on Atlantis and Mount Olympus, fueling myths among ancient human cultures. In modern times, the Eternals have come to Earth as superheroes and joined forces with the Avengers. Much like other Marvel superheroes, Eternals can possess specialized powers like flight or super strength in addition to the near-immortality that characterizes their species. Rumors about The Eternals have persisted since the first appearance of Thanos–a Deviant–in The Avengers. In 2018, Feige announced that a film version had gone into development, with Oscar-winning actress Angelina Jolie (herself a member of the queer community) set to play the heroic character Sersi. At present, Marvel has yet to announce which characters will comprise the rest of the team line-up in the film, as well as the character that will identify as gay in the film. Several actors have confirmed to have tested for the role, however, including Wilson Cruz and Brian Jordan Alvarez. Filming begins this August. What kind of pisses me off is that we might be in a for another “La Fou” scenario where a character with no effect on the plot, who is somehow still lesser than everyone else is *implied* to be gay. The extra kick in the teeth is that it’s a character who isn’t even popular or prominent in the comics so it’d be easy to not really give it any gravitas if it doesn’t stick. If they really had any guts, it’d be somebody like Bucky. Winter Soldier made a better case for Bucky as a love interest than Sharon, “Captain America: The First Avenger” also fed this notion that Bucky might’ve grown to love Cap. Whether or not it could be reciprocated, well, that’s another thing but if it *couldn’t* that’d be relatable and more poignant. I’ll start fawning over them when a real risk like Black Panther is taken with queer people, until then we shouldn’t indulge them too much or build too much expectation.